« My very first Cyberstamp! A Little Bit Of This And That…….. Your life is: Awesome. Quirky. Exciting. Perfectly messy. And happening really fast. So we’re happy to introduce our newest product line that lets you capture it all on-the-go. 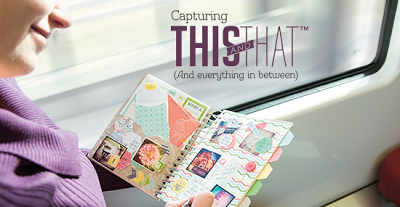 This and That debuts in the 2013-2014 annual catalogue, but we’re giving everybody the chance to get it now. And through 31 May, you can get a special bundle with all five products for 15 percent off! Want to know more? Call me for details of how to grab your This and That package at 15% off the total price. Remember it’s only available during the month of May.